Culture Shock! 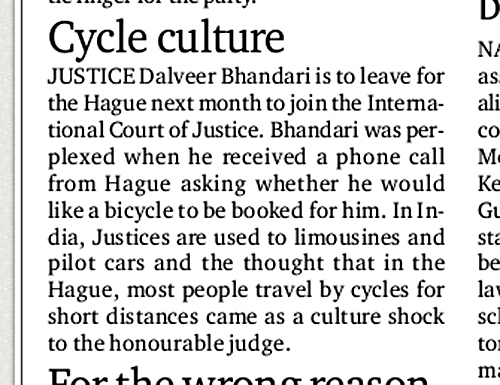 Judge from India taking a position in The Hague NL, asked whether he would like a bicycle to be booked for him. So what will the perplexed honorable judge find in The Hague? A city that has been criticized in the past for slightly less good cycling conditions. Well, to give him (and you) an idea I went there and filmed. Not so bad, is it? I think the judge could very well give it a try after all! The Hague has a population of a little over 500,000 and is the third largest city in the Netherlands. Although Amsterdam is the capital, the seat of the Dutch Government is in The Hague. The city is also home to a number of international (legal) organisations. Such as the International Court of Justice with its seat in the Peace Palace. The Hague has about 400 kilometers of separated cycle paths and 70 kilometers of on street cycle lanes. From 2006 to 2010 the city invested 34 million euros in cycling. That money was spent on things like replacing old concrete tiles by smooth red asphalt for 55 kilometers of cycle path and by building cycling infrastructure in 22 missing links. From 2011 to 2014 the city has allocated another 34.5 million euros and from third parties another 14 million euros is available. That makes a total of 48.5 million euros to further improve cycling conditions in four years. improving the surface of existing cycle infrastructure. From 2006 to 2010 cycling increased by 10%. The following 2011-2014 plan aims to work to an increase in cycling to a percentage of 30% by 2020 and 50% by 2030, as compared to the rate of 2005. (facts and figures from the city’s 2011-2014 cycle plan – PDF in Dutch only). Spring 2012 the Dutch prime-minister (left) leaves one of the state offices in The Hague by bicycle. Cycling in The Hague is good enough for the Dutch prime minister, so it should also be good enough for a judge. I wonder whether the US President would if he visits the Hague, or the rest of the Netherlands, would also like an official bicycle. I don’t think the security guards would like that idea. And if Barrack did manage to get on a bicycle without the security guards surrounding him putting an armoured shell around it, whether the US president would like a helmet. I guess the crime rate is so low in the Netherlands that he doesn’t have to worry about someone assassinating him by running him over in a car. I also found the Dutch prime minister in 2010 heading over to Vancouver, rode one of the OV-Fiets bikes he brought along with him, and test rode them (actually I imagined that he used them in the Netherlands already), and of course in the traditional Dutch style, without a helmet. Someone told him that helmets are actually obligatory in Vancouver. He asked why didn’t someone warn him? That was an amusing conversation and I wish I paid attention to that too rather than dozing off after Wayne Gretzky ran through the city lighting up the torches. I love that riding a bike in the Netherlands is something that all levels of society do, it’s great that the government see cycling as something for everyone, not just the proletariat. It makes me smile to know that they phone up foreign dignitaries asking them if they’d like an official bike! 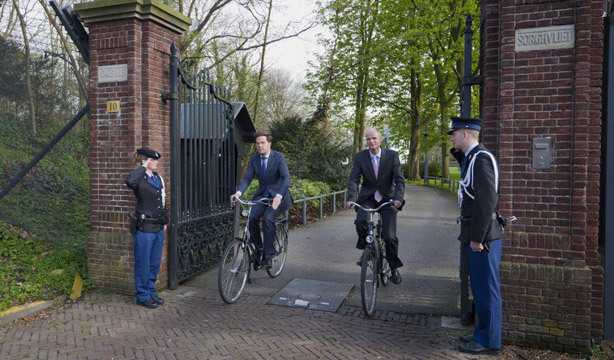 And what do the Dutch security services think of politicians riding bicycles? I know national leaders of government tend to be worried about security. So much so that a new limo is built for the US president after each term. Many politicians commute by bike. Watching the video reminded me how amazing I found being able to cycle right through the Royal Palace. Colibri: it’s even possible to cycle through the Binnenhof, the old Dutch Parliament building; entry and exit through narrow gates, with a short trip over old court-yards in between. Just down run down the politicians. I wonder if it’s possible to get an official reaction of Mr. Bhandari, now that the shock may have worn off. It’s good to be reminded that, in many ways, the Dutch are still pretty down to earth. He probably took it as a calculated insult based on the fact that,until recently, cycling was the preferred mode of transport for all Indians below the poverty line. What a beautiful city. Thank you for sharing this story. There were special talks in the coalition for weeks and every day the prime minister went by bike with his adviser for all those weeks, rain or shine. A great number of politicians can be seen cycling in the Netherlands. Now and in the past. When spiteful comments on the PM’s cycling appeared it transpired that all departments in The Hague have a stable of official bicycles for trips within the city. In the PM’s case he used one from his own department, a Gazelle Primeur stepthrough (they are all stepthroughs for general use). But I suppose his normal transport between home and office will be his official car, if only because of the loads of papers cabinet ministers have to take home – although former minister Donner reputedly always cycled to and from home followed by his driver plus paperwork. Another striking example is the former member of the Den Haag city executive and subsequently junior minister, Jetta Klijnsma. She suffers from chronic spasms but insisted on cycling to her job for the Den Haag council. She was entitled to be driven to work but instead got her driver to pick her up every morning on a tandem bike. In the following video she explains that she made the choice to cycle to and from work (and to and from appointments around the city) after realising that she spent most of her work sitting down in meetings. If you ride a tandem and you go through something like a red light illegally, who gets fined? This entry was posted on 25 June 2012 by Bicycle Dutch in Original posts and tagged bicycle culture, Den Haag (the Hague).